Chocolate ice cream with peanut butter fudge brownies. Yum! This is a very special week at 365scoops. The first person to tell me why gets $5 off his/her next order! Anyhow, on Sunday I taught a really fun ice cream class and my wonderful students brought so much joy and energy to the class, that it made making ice cream such a blast! My students requested two flavors, one with a vanilla base (to be seen later this week) and one with a chocolate base. They told me that they love chocolate peanut butter, and immediately I knew that we had to swirl in some peanut butter brownies. I spent the week testing new recipes (which resulted in lots of additional junk food in Casa Sugar but what can you do?) and found the perfect combination of salty, sweet, and of course, chewy and fudgy. Many of my ice creams include baked goods, and for each of these recipes, I always slightly undercook the cookie or brownie. The reason being that when frozen into ice cream, these cookies or brownies harden quite a bit. If you use a fully cooked brownie, it will be rock solid when you take a bite. We all know that breaking a tooth on ice cream would really ruin the dining experience! So, instead, I shave a few minutes off the baking time (don’t worry the eggs are fully cooked!) and voila, you’ll have delicious home-made mix-ins! Do you see those mini peanut butter cups? And the chocolate chips peeping through. It was totally delicious! Preheat oven to 350 degrees. Line an 8×8 baking pan with tin foil, making sure that it covers all sides of the pan. Grease with either butter or spray. Chop the butter and the chocolate into pieces. In a medium saucepan, melt the butter, stirring occasionally to break up the chunks. Melt butter add and add the chopped chocolate, whisking thoroughly until all the chocolate is melted. Remove from the heat and transfer to a large mixing bowl. Add in sugar and mix thoroughly. Add in the two eggs and again, mix completely. Slowly add in the flour and salt and beat vigorously for 30 seconds. Pour half the batter into the pan, sprinkle the milk chocolate/peanut butter chips on top, and cover with the remaining batter. Top with mini peanut butter cups and bake for 23-35 minutes until the brownies set, but are still chewy and fudgy. The brownies can be stored at room temperature for up to three days. Sift the cocoa into a bowl. Pour in the chocolate chips and the chopped unsweetened chocolate. Set aside. Pour the half-and-half into a medium saucepan and heat until steam begins rising (but it’s not boiling). Once heated, pour in the triple chocolate mixture whisking vigorously until the chocolate is well-mixed and entirely melted. 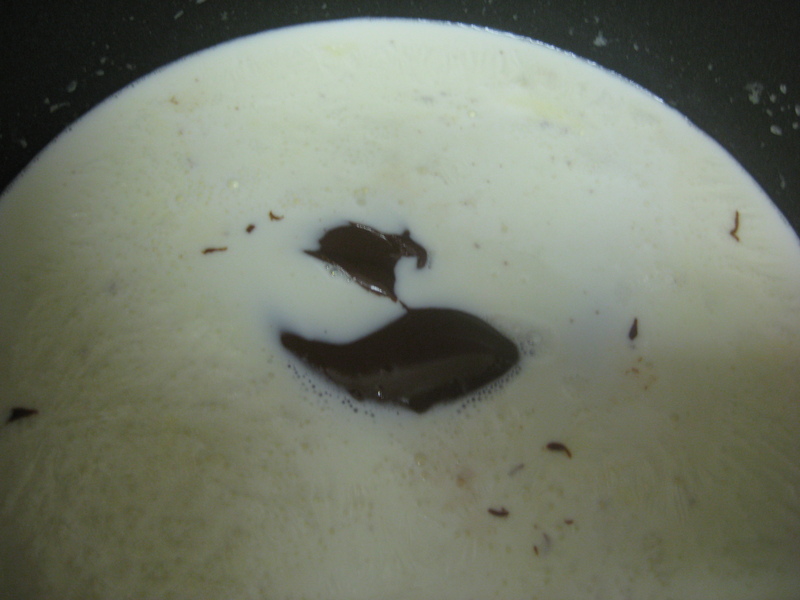 Continue heating the chocolate milk mixture until small bubbles begin to form around the edges. Set aside. Whisk together the three egg yolks in a large heat-proof bowl, slowly adding in the sugar until the mixture thickens and turns pale yellow. To temper the eggs slowly pour in the chocolate mixture and whisk into the egg mixture. Pour back into a medium saucepan and heat until the mixture reaches 175 degrees or is thick enough to coat the back of a spatula. Remove from heat, cool thoroughly and then refrigerate for 1-2 hours. When you are ready to churn pour into the base of an ice cream maker and churn according to manufacturer’s instructions. Approximately 5 minutes before the ice cream is done, pour in the brownie chunks. Transfer to a freezer safe container and let freeze for 2 hours before serving. Enjoy! The Verdict: I suppose you know something is good when we dig into the pan of freshly baked brownies and literally cannot stop eating them! As soon as they came out of the oven, my students and I had to taste them, and once we did, we were addicted. For every brownie chunk that we put into the ice cream, we took another one for ourselves. It was absolutely delicious. Dig in and enjoy! Up close and personal. Dig in! Anyhow, I found this great recipe for Nutella Mug Cake which I realized would be far superior with Nutella Gelato a-la-mode. So, on Saturday night, with an apartment full of friends, I set out to make this creation. Suffice it to say it was totally insane. These cakes cooked beautifully in the microwave (warning, do not try cooking two at once, they must be cooked individually) and then topped with freshly churned Nutella Gelato, a dollop of Nutella and fresh hazelnuts…what else can I say? Insanity. All the ingredients for the molten cake, set and ready to go! Once fully chilled, pour into the bowl of an ice cream maker and churn for approximately 20 minutes or according to the manufacturer’s instructions. Once the ice cream begins churning, make the cakes. Combine all ingredients in a mixing bowl. If you wish to double or triple the recipe (these are rich!) go ahead, it can be doubled and just baked separately. 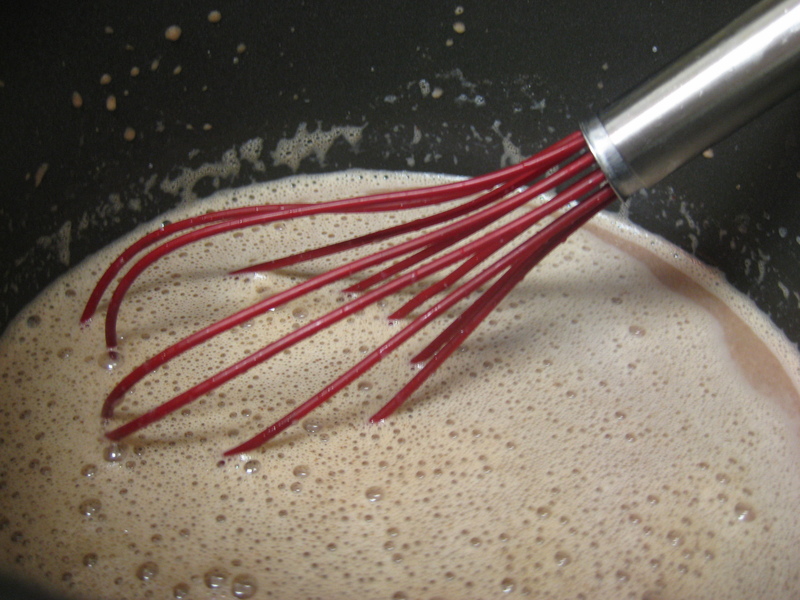 Whisk well with a fork until smooth. Pour into a large mug and microwave on high for 1 1/2 minutes. The time depends on the wattage so it can take up to 3 minutes to cook. Remove the cakes from the microwave and let cool for a minute before serving. Put two heaping scoops of ice cream on top (warning it melts extremely fast), along with a dollop of Nutella and crushed hazelnuts. Or, you can serve the mug cake on a saucer with 2 scoops of ice cream, Nutella and hazelnuts on the side. Either way, it’s totally sinful and outstanding! The Verdict: Insanely rich and delicious! This cake should definitely be shared between two people (and that means a lot coming from a sweet-o-holic!). Topped with dollop of gelato, nutella and toasted hazelnuts, I’m telling you, yum yum yum! This is the perfect dessert for National Chocolate Week, dig in! I’m sorry to say but this ice cream should be illegal. No one should be allowed to eat such a rich, delectable dessert. When push comes to shove, I think this blog may be an eensy weensy teeny weeny bit of a rebellion from my childhood. As a kid, dessert was fruit, or if we were lucky, tofutti cuties. There was never any candy or sweets in our house. It was practically a health food store. In retrospect, I’m extremely grateful, but as a kid, it was torturous. In fact, I always wanted to have a playdate at a friend’s house just so I could stuff my face with Oreos. Oh, the hearbreak. As an adult, sometimes I feel like I’m making up for lost time, eating all the chazerai in sight. This blog is an amazing excuse. Enter the double stuffed Oreo. As if one glob of vanilla creme isn’t enough, hell, let’s add two. Double the trouble, calories and cholesterol? Oh, did I mention that as a little girl I had high cholesterol? Yeah, that’s right. Seems almost unbelievable. I was rail thin and uber petite. Friends – cholesterol does not discriminate! Hmmm…how do I respond? Inner dilemma. Inner monologue. You see, technically, no. But not so technically, um, yeah. I suppose if eating them during the summer at camp, and occasionally in the privacy of a friend’s pantry, then yes, yes I do eat Oreos. For the record, I never admitted one word of that to her. Newsflash lady: I was the healthiest child in our school. Hands down. I promise. How the hell did I have high cholesterol? To this day I will never know. But what I do know, is that double stuffed Oreos are delicious. Even more delicious covered in chocolate and salted caramel. Let me explain how this flavor came to be. I had a craving for double stuffed Oreos. I thought they would be good in chocolate. I had left over salted caramel, and I know it goes well with chocolate. There you have it! Hand-dipped double stuffed Oreos covered in salted caramel, swirled into vanilla bean ice cream. Need I say more? First, make the vanilla ice cream base. Pour the half-and-half into a large saucepan. Add in the vanilla bean paste and vanilla extract. Heat until small bubbles form around the edges and set aside. In a large heat-proof bowl whisk together three egg yolks and 3/4 cup of sugar until the mixture gets pale yellow and thick. Temper the eggs by slowly pouring the hot milk liquid into the egg yolks, stir thoroughly. Once mixed, pour back into the saucepan and heat until it reaches 17o degrees (using a food thermometer) or, if you don’t have one, until it is thick enough to coat the back of a spatula or wooden spoon. Let the mixture cool completely before refrigerating for at least 2 hours. While the mixture is cooling, melt the chocolate chips in the microwave on high for 30 seconds, stir, cook for another 15 seconds, stir and repeat until the chips are fully melted. Warning: this part gets messy! Dip the Oreo into the bowl of chocolate, rotate so all edges are covered, and then flip to cover the other side. Remove from the chocolate and place on a parchment-lined baking sheet. Repeat until all 12 cookies are dipped. Place in the refrigerator for 30-45 minutes until the cookies are completely cooled and the chocolate has hardened. Cooled and drizzled with salted caramel. Amazing. Remove from the refrigerator and drizzle the cookies with the salted caramel sauce. Place back into the refrigerator for another 30 minutes so the caramel hardens. At this point your ice cream base should be cool enough to add to the machine. Pour into the base of your ice cream maker and churn according to the manufacturer’s instructions. While it’s churning chop up the cookies and set aside. Approximately 5 minutes before the mixture is done churning, pour the cookies into the ice cream maker, allowing them to mix together thoroughly. Remove from the ice cream maker and transfer to a freezer-safe container. Let harden for 2-4 hours in the freezer (and if you can stand it, overnight!) and then enjoy! The Verdict: Those magical cookie bites were so delicious and the ratio of cookie-to-ice cream was perfect! I served this treat for some friends – it was their first time trying 365scoops and the reviews were positive! (phew). I really loved using double stuffed oreos because the cream is so delicious – and having double the cream, plus chocolate and caramel, well, that’s just sinful! Enjoy.